Inspired by a passage from Proverbs 4:23, my previous reflection shared on the importance of cultivating a healthy heart. As King Solomon implores, “Above all else, guard your heart, for it is the wellspring of life.” So how do we do that, guard our hearts above all else? Do I do this because I feel I should? If you answer that you feel you should do this activity, it’s a good sign that activity needs to come off your calendar. Women and mothers are notorious for doing things because we feel we should. And If we don’t do them, we feel guilty because we’ll let someone down or miss out. If you’re putting stuff on your calendar because you guilt yourself into it, pray for courage to stop doing that activity. That kind of thinking is rooted in the popular phrase FOMO, the fear of missing out. 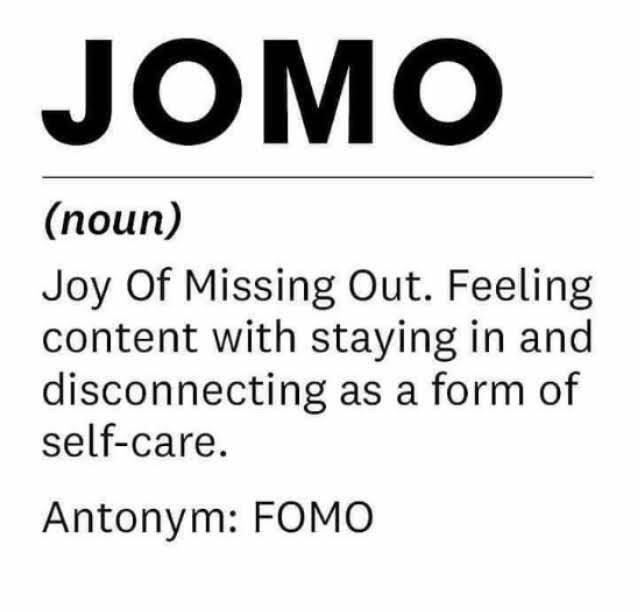 Rather than FOMO, let’s consider its antonym: JOMO. What’s JOMO? Several weeks ago my sister texted me this graphic from Women’s Health magazine. So that brings me to another thought: holy leisure. Saint Pope John Paul II prophetically proclaimed in his Letter to Women that ”Women will increasingly play a part in the solution of the serious problem of the future.” What was the first serious problem he listed that women would help solve? The lack of leisure time. Holy leisure allows us to enjoy beauty, to express our God-given need to create, to engage in activities that refresh and ground us. Writing, singing, playing an instrument, reading, sewing, cooking, running, playing ball with the kids, meeting a friend for coffee and conversation. Whatever the activity, one step in guarding our hearts involves being intentional about having space in our days for holy leisure. Often when my heart is feeling down and out, I’ve come to learn that I’m most likely tired and weary. When I was going through a long stretch of time where I felt really discouraged, a medical professional asked me 1) What time do you go to bed? and 2) How much sleep are you getting? She asked me those questions because research states over and again how important sleep is to the human body, yet contemporary culture doesn’t seem to get it. We value doing. We value productivity. We esteem the person who gets up early, goes to bed late, and gets lots done in between. Let’s take off that badge of exhaustion in favor of the discipline of rest: determining to get enough sleep at night, choosing a nap over doing the dishes or scrolling through our phones, resting on Sundays or at least one day in seven, scheduling retreats or what I like to call “Mother’s Sabbaths.” Gifting ourselves with opportunities to be set free from the normal daily routine will nourish and restore our hearts. A priest friend of mine recent said, “We have one job: to listen to and do God’s will for our lives.” This is why it is essential to pull away to a quiet place to pause and reflect to connect with where God is leading us. Jesus models this for us when he goes off to a deserted place to pray. If Jesus had to do this, how much more should we? Cultivating the discipline of refection will be unique for each of us. Maybe it’s fifteen minutes each morning in mental prayer, performing a daily examen each night before bed, weekly Adoration, journaling, whatever. Making a priority to schedule quiet, reflective time helps us orient our hearts toward God and develop the discipline of reflection. So there are some thoughts about guarding our hearts. I’d love to hear and learn from you. 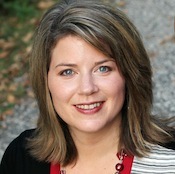 What disciplines help you guard your heart as King Solomon instructs in Proverbs?